Need a little meal-time inspiration? Check out these recipes, courtesy of some of our favorite vegan bloggers, activitists and friends. California Creamed Kale – as featured in our film! Beet Carrot Cake with Warm Butternut Lemon Sauce and Macadamia Whipped Cream – as featured in our film! Preheat oven to 350 degrees. Prepare muffin tins with paper muffin cups. In a large bowl, combine Earth Balance and agave, whisk to combine. Add applesauce, vanilla, pineapple, coconut and walnuts to mixture, still until incorporated. Stir the dry ingredients into the wet ingredients and mix until just combined, making sure not to over mix. Pour the batter into the paper lined muffin cups, about 3/4full. Back for 25 minutes, or until the toothpick comes out clean. Cool for 10 minutes and enjoy! This is one of those simple, comforting dishes that are just as good for dinner as they are for brunch. Have potatoes cooked ahead of time and this easy and tasty dish will have your family eating in short order. Leftovers are wonderful for breakfast. Or, if you make this expressly to serve in the morning, you can either microwave or cook the potatoes the night before for a head start. Great accompaniments include Israeli Salad, orange slices, and fresh whole grain bread. Adapted from The Vegetarian Family Cookbook. Bake or microwave the potatoes in their skins until done but still firm. When cool enough to handle (ideally at room temperature), peel and cut into small dice, not larger than 1/2 inch. Cut the tofu into 1/4-inch-thick slices. Blot well between paper towels or clean tea towels (or use the nifty Tofu XPress a little ahead of time! ), then cut into approximately 1/4-inch dice. Heat the oil in a large, wide skillet. Add the diced potatoes and tofu, and the optional bell pepper. Sauté over medium heat, stirring frequently, until the mixture is golden brown all over. Stir in the scallions, and sprinkle in some paprika. Season with salt and pepper, and serve. Add a medium-small zucchini, finely diced, along with the potatoes and tofu. Stir in 3 or 4 leaves thinly sliced kale or collard greens along with everything else. Replace a couple of the potatoes with a sweet potato. When everything is done, throw some baby spinach over the top, cover, and cook until it wilts, then stir it in. Pre-heat oven to 350. Cut polenta into 1/4 inch slices to make circles. 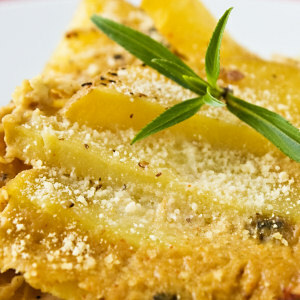 Coat casserole dish with light olive oil, place polenta on dish. chop onion, sauté onions in olive oil. Add a little brown sugar to caramelize, if desired. Chop oyster mushrooms and garlic, add to onions, cook for 1 minute with onions. Add to polenta dish. Bake for ten minutes. Add spinach, arugula, and lemon on top. Continue to bake for 2 minutes. Ready! A note from Kelsey: Feel free to add any ingredients. I added vegan sausages, rosemary, pepper. I’ve made it a bunch of times in various ways. Always tastes good, but the lemon is key. Saute garlic and red pepper. Let it cool for 5 minutes. Put in vitamix/blender. Drain black beans. Add black beans and lemon juice to blender. Blend for 1 minute. Add quinoa, blend for 1 minute. Done! Add to tortillas hot or cold. Add salsa if you’d like, or hot sauce! YUM. Toss the dough according to instructions – usually just tossing it around Mario style until it’s thin and shaped like a pie. Spread it on a pizza stone or regular baking sheet. Pinch the edges to create a little crust, then brush the entire thing with a thin layer of olive oil. Toss on as much of the canned diced tomatoes and sauce as you like, sprinkling in the garlic. If you’re going cheeseless, toss on the veggies and bake. If you’re going with daiya, sprinkle a layer over the tomatoes, then toss on the veggies. Save the fresh basil for the end, after you’ve baked it for about 20 minutes at 350 degrees. Slice the tempeh about 1/4-inch thick. In a flat, microwavable baking dish arrange the tempeh slices in a single layer. Mix the remaining ingredients and pour over the tempeh. In the microwave, cook on high power for 3 minutes. Turn or rearrange any pieces that were not covered by broth and microwave on high for 2 minutes. Then cook at 50% power for 3 more minutes. Allow the tempeh to stay in the broth until you’re ready to assemble the casserole. Make the sauce by putting all the sauce ingredients except the tarragon into a blender and blending until completely pureed. Stir in the tarragon just before using the sauce. Preheat the oven to 400F. Oil a large, 3-quart casserole (or use two smaller casseroles). Wash the potatoes and cut them in half lengthwise. Slice each half into 1/4-inch slices. Put half of the potato slices in the bottom of the casserole dish. Lift the tempeh out of its marinade and arrange it on top. Put the remaining potatoes over the tempeh. Stir the sauce and pour it over the potatoes. Sprinkle with black pepper and cover tightly. Bake for 45 minutes. Remove the cover, sprinkle with vegan Parmesan, and bake for 10-15 more minutes, until potatoes are tender and sauce has thickened. Remove from the oven and let stand a few minutes before serving. Cover the top loosely with waxed paper and put the dish into the microwave. Cook on high power until heated all the way through, 2 to 3 minutes. Microwaves vary, so check to make sure that the inside is warm by inserting a knife into the middle and checking a sample. Place the water and onion in a large non-stick skillet and cook for 2 to 3 minutes. Add mushrooms and cook until mushrooms are slightly limp. Add cayenne, wine, tamari, soymilk, and broth and mix. Cover and cook over low heat for 20 minutes, stirring occasionally. Uncover and add cornstarch mixture to pan, cook, and stir until thickened. Season with black pepper to taste. Serve mushroom mixture over fettuccine. for five minutes or until browned. Add chopped onion, garlic, tomatoes, carrot, celery and red pepper. Stir and sauté for five minutes, or until tender. Add water, black beans and tomato paste. Stir until combined. Season with chili powder, cumin and salt. Reduce heat and cover for 45 minutes. Let cool slightly and serve. Stir-fry the diced onions in a dry skillet (no oil) until they are very brown. You can add a little bit of water from time to time if they start to stick. Add the minced garlic and fry that for about 30 seconds. Then add about 3 cups of water and the potatoes, cauliflower, and diced tomatoes. Add the spices. Cover and simmer until the potatoes and cauliflower are tender. Serve with rice. Garnish with parsley or kale. A note from Laurie: It’s hard to give an exact quantity for the potatoes and cauliflower, because their sizes vary, and some skillets are bigger than others. If I fill my skillet with vegetables, it yields about 6 servings. Recipe from Let Them Eat Vegan by Dreena Burton, published by Da Capo Press. For more on Dreena’s recipes, visit her blog eat, drink & be vegan. THIS is comfort food. 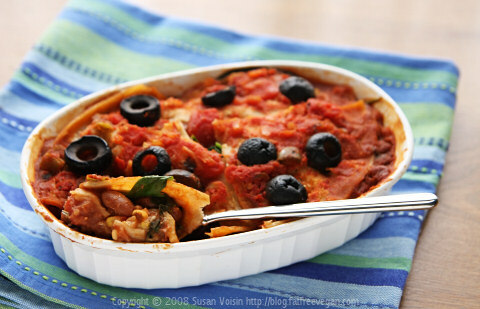 A macaroni ‘n cheese type of casserole, this dish is made without tofu or cheese substitutes. The sauce isn’t super cheesy; it’s alfredo-y–creamy, rich, and luscious–with a crunchy bread-crumb topping (like my mom used to make). Preheat oven to 375 degrees. Get all ingredients ready to blend for sauce, then start cooking pasta. While pasta is cooking, blend all sauce ingredients in a blender or in a deep bowl with an immersion blender. Once pasta is almost tender, fully drain (don’t rinse). Mix noodles with sauce, and immediately pour into a lightly oiled 8 x 12″ baking dish. (it will look like there is a lot of runny sauce – it will thicken up, trust the pasta!) Mix breadcrumb toppings in a small bowl, then sprinkle over top of casserole. Cover with foil and bake for 17-18 minutes. Then, remove foil cover and bake another 5-7 minutes or until topping is golden brown and crisped. Don’t overbake or sauce will get too thick. Remove from oven and place casserole on a hot plate (rather than on top of oven, since residual heat from oven will continue to thicken the sauce). Serve! Note: This may not seem like a lot of pasta for this dish but once it cooks and soaks up some of the sauce, this dish makes enough to happily serve 3-4. You can use another 1/2 cup of dry pasta, but I wouldn’t use any more than that–you’ll lose out on the sauce and instead will have a dry casserole. If you have leftovers (IF! ), place in a heatproof dish. Drizzle in a touch of non-dairy mil to remoisten the mixture while baking. Cover and bake until heated through, then remove cover for a couple of minutes to crisp up the topping again. You can make your own breadcrumbs (and use up any heels of bread!) by processing slices in a food processor until fine. Use bread of choice–whole-grain, wheat-free, gluten-free, etc. If you want a really crunchy topping, use store-bought dry breadcrumbs. If you like lots of that bready kind of topping, use the full 1 1/4 cups, but if you like more of the saucy stuff (like me), use just 3/4 cup. Or, divvy the breadcrumbs over the top of the casserole to please family members–less on one side, more on the other! Nut-Free version: When our baby was just a year, I wanted to do a nut-free version of this casserole that I could serve to the entire family. I decided to use tahini in place of the nuts, along with a few other changes. For that version, omit the nuts entirely and substitute 1/2 cup tahini sauce. Keep the lemon juice, garlic, increase arrowroot to 1 tbsp, keep onion powder, mustard, water and milk, and use 2-3 tbsp of olive oil. Also add 3 tbsp of nutritional yeast, 1/2 tsp agave nectar and 1/2 tsp (roughly chopped) fresh rosemary leaves. By Dreena Burton, from her cookbook Vive le Vegan. A note from Dreena: This recipe is one of my favorites. It’s much like a ratatouille, but using chickpeas instead of the traditional eggplant and zucchini, and an original spice combination. The result is a dish with a complexity of flavors and the bonus of minimal preparation! Preheat oven to 400°F (204°C). In a large, deep casserole dish, combine all the ingredients except the bay leaves. Stir through until well combined, then embed the bay leaves in the mixture. Cover and bake for 30 minutes. Stir through, cover, and bake for another 35-45 minutes, until the onions are tender and translucent (stir through again once or twice through baking). Remove bay leaves and serve with a cooked grain such as quinoa, wild rice, or brown rice. Makes 4-5 servings or more, depending on accompaniments. You can use regular diced tomatoes, or Italian flavored or fire-roasted. Try making burritos with any leftovers. Spoon the mixture onto flour tortillas; roll up and place side-by-side in a baking dish. Sprinkle with some non-dairy cheese and bake. Amie Valpone, The Healthy Apple. In a large pot of boiling salted water, cook pasta according to package instructions. Drain pasta, transfer to a large bowl, and toss with zucchini, mushrooms, corn and spinach. Set aside. In a small mixing bowl, combine lemon zest, juice, olive oil, chives, red pepper, sea salt and black pepper; whisk well to combine. Pour olive oil mixture over cooked pasta mixture; gently toss to combine. Transfer to a serving bowl and serve immediately or cover and store in the refrigerator until ready to serve. Chop kale into bite-size chunks, cut red pepper into cubes. Saute red pepper in olive or grapeseed oil for 1 minute. Add kale, add 1 tbsp of water, cover for one minute to let it steam. Add garlic, continue cooking for 2 minutes or until kale is soft. Sprinkle on slivered almonds… DONE! A note from Kelsey: You can add red pepper flakes, pepper, salt. Cut up the vegetables into small chunks and place them in a baking dish. Mix the herbs into about half a cup of water or stock, with about a tablespoonful of balsamic vinegar. Pour over the vegetables. Put it in on the bottom rack of the oven and turn the oven on and set it to 350 degrees. Stir-fry a chopped onion over medium heat in a dry pan until the onion is very brown. Then add two cloves of minced garlic and fry for another minute or so. Then add 2 cups of water and 1/2 cup chopped fresh mushrooms or a handful of dried mushrooms. Let it simmer slowly until you are about ready to serve the vegetables. Then combine 1/4 cup of cornstarch with another cup of water. Mix thoroughly, then stir it into the boiling mushrooms. Keep stirring until it is thickened. You can adjust the amount of water and cornstarch until you get the desired volume and consistency. Serve the gravy over the roasted vegetables. As featured in our film, from Dr. Fuhrman’s collection of recipes in his books and in the member center at DrFuhrman.com. Remove the thick bottom of the stems from the kale and place the leaves in a large pot with steamer. Steam 10 minutes, until soft. Remove from steamer, placing in wooden chopping bowl. Press the kale together in the bowl with a dish towel and tilt over the sink to remove some of the excess water. Add the remaining ingredients to the blender and blend until smooth. Chop the kale, mixing it with the cream sauce as you chop. 2. Melt Earth Balance in microwave or over medium heat. Add to graham cracker crumbs in a bowl and mix until well coated. 3. Line the bottom of a 9 × 13? baking dish with parchment or wax paper. Spray with canola oil. Pour graham cracker mixture into prepared pan and flatten firmly with spoon or fingers to set. 4. Sprinkle the shredded coconut evenly as a layer into the pan, followed by chocolate chips and lastly walnuts. Press them down to set. 5. In a bowl, whisk together coconut milk, vanilla, arrowroot, salt and agave nectar. Pour evenly over top of baking pan to distribute equally. 6. Bake bars for about 30 minutes, or until light brown at the edges. Cool and let set in the refrigerator for several hours or overnight. Cut into bars and enjoy! Preheat oven to 350 degrees. Mix flour and baking soda in a bowl. In a larger bowl, beat date sugar, blended pineapple, mashed banana, and applesauce together. Stir in the vanilla and mix thoroughly. Add the flour mixture along with the chopped walnuts and mix. Now add the shredded carrots and beets. Mix well. Spread in a nonstick baking pan. Bake for about 50 minutes, or until a toothpick inserted into the center comes out clean. Warm Butternut Lemon Sauce: Simmer butternut squash and date sugar in 1 cup of water, covered, about 15 minutes until tender. Puree squash with liquid, add lemon, lemon zest, and lemon extract. Keep warm and serve over warm cake. Macadamia Whipped Cream: In VitaMix or food processor blend together until smooth and creamy. Place dollop over cake and Butternut Lemon Sauce. Nava Atlas, VegKitchen. Photo by Susan Voisin, FatFree Vegan Kitchen. Here’s a way to enjoy a delectable crumble, minus the 30 minute baking time usually required. The twist here is that it’s made on the stovetop rather than baked in the oven. This recipe originally appeared in Vegan Express. Peel the apples and cut into fairly thin (about 1/4-inch-thick) slices. Heat the margarine in a medium skillet. Add the apples. Sauté, stirring frequently, until they have softened but still hold their shape, about 4 minutes. Add the berries, maple syrup, and cinnamon, and cook until the the berries have started to burst and the apples are just tender, about 3 to 4 minutes longer. In a small container, combine the cornstarch with just enough cold water to dissolve smoothly, and stir into the skillet. Cook briefly, just until the liquid in the skillet is thickened, then remove from the heat. Heat a smaller skillet. Add the muesli and sugar, and toast over medium heat, stirring frequently, until the mixture turns a shade darker and smells nutty, about 4 to 5 minutes. Sprinkle evenly over the surface of the fruit. Allow the crumble to cool in the pan for a few minutes, then serve in small bowls. If desired, top each serving with a dollop of ice cream. Super Fudge Low Fat Brownie. 1. Soak the prunes in water until very soft. Pour prunes and soaking liquid into a blender and blend until perfectly smooth. Use immediately or refrigerate up to 2 weeks in an airtight container. 2. Position a rack in the middle of the oven and preheat to 350? F. Oil a 9 x 9-inch pan with oil. 3. Place a wire mesh strainer over a medium bowl. Add pastry flour, white flour, arrowroot, cocoa, sugar, baking soda, baking powder and salt to the strainer and stir with a whisk to sift into the bowl. Whisk to distribute the ingredients. 4. In a separate bowl, whisk oil, maple syrup, prune puree, water and vanilla until completely blended. Pour into the dry ingredients and mix until smooth. The batter will be thick)Stir the walnuts and chocolate chips, if using into the batter. 5. Spread the batter into the prepared pan evenly. Bake for17 to 18 minutes, until the top looks dry and set, and the sides of the brownies have pulled away from the sides slightly. A tester inserted into the center will be coated with very moist cake, but the cake will not feel gummy. The brownies will firm as they cool. 6. Place the pan on a wire rack and cool to room temperature. Refrigerate or freeze before cutting–cold brownies slice neatly. Store in the freezer, well wrapped up to a month. The brownies taste great straight from the freezer! Put the finely chopped chocolate into a medium heatproof bowl. 2. Pour the milk into a in a small saucepan and heat to just under a boil over medium heat. Pour over the chocolate. Swirl the bowl to submerge the chocolate. Allow the chocolate to begin to melt about 2 minutes, then whisk until smooth. .3 The ganache will be thick enough to spread on the brownie in 10 to 20 minutes at room temperature. Spread the ganache over chilled brownie for the shiniest glaze. This colossal cake elicits oohs and ahs when set out for serving but the proof is in the tasting and this cake goes to the head of its class. A bundt is a deep pan with a hollow center core, similar to an angel food cake pan but with fluted sides. The hollow center is necessary to ensure that the large amount of batter bakes through. The zest is a major flavor component of this cake, so it’s important to seek out organic, unsprayed fruit. You can certainly use the juice as well as the zest in the cake. The recipe looks long but it quick and easy to make. 1. Position a rack in the middle of the oven and preheat to 350° F. Oil a 10- to 12-cup bundt pan very thoroughly. 2. Place a wire mesh strainer over a medium bowl. Add pastry flour, white flour, baking soda, salt, baking powder, maple sugar, and sugar to the strainer and stir with a whisk to sift the ingredients into the bowl. Whisk to aerate and distribute the ingredients. 3. Combine the oil, orange juice, soymilk, vinegar, vanilla extract, and orange zest in a separate bowl, and whisk until thoroughly emulsified. Pour into the dry mixture and stir with a whisk until the batter is smooth. 4. Pour the batter evenly into the prepared pan, and rotate the pan to level the batter. Tap the pan lightly on the counter to eliminate air bubbles. 5. Bake for 45 to 55 minutes, until the cake is golden and firm at the center when touched lightly. A tester inserted in a few spots near the center of the cake should come out clean or with only a few moist crumbs. 6. Remove the cake from the oven and cool in the pan on a cooling rack for 10 minutes. Place another cooling rack on top of the cake and turn the pan upside down. Tap the pan gently and the cake should release. Cool completely before glazing or serving. Eliminate the nondairy milk and use 2 cups of orange juice. -Stir 1 cup dried cranberries into the batter. -Use two 9 x 3-inch round pans or use a 9 x 13 x 2-inch pan to make a sheet cake. Bake for 25 to 35 minutes. 1. Combine cocoa, sugar, and salt in blender or food processor. Pulse a few times to mix. With the motor running, pour the hot water into the machine. Add the maple syrup, oil, and vanilla. Process about 1 minute, until smooth. 2. Refrigerate in a covered container for up to 2 weeks or freeze for up to 2 months. The sauce will thicken slightly. In a medium bowl, gently toss cherries in olive oil. Place cherries into a large piece of tin foil and fold to seal foil at the top. Transfer cherries in foil to the heated grill; cook for 10-12 minutes or until tender. Meanwhile, in a medium bowl, mash avocados until it forms a chunky consistency. Remove cherries from grill; set aside for 2 minutes to cool then add to the guacamole mixture along with remaining ingredients; mix well to combine. Serve immediately. Garnish with additional fresh basil. Kind of a marriage of guacamole and hummus, and infused with a good amount of tender greens, this rich dip makes a unique statement. Serve with tortilla chips, fresh pita, pita chips, raw veggies, or a combination thereof. Photo by Susan Voisin, FatFree Vegan Kitchen. Recipe from Wild About Greens by Nava Atlas. Variation: Replace some of the greens with a handful of vitamin-C-rich watercress. This is so simple it barely qualifies as a recipe. But it’s so tasty that it hardly matters. Serve with plenty of good-quality tortilla chips. Or scoop some of the hot dip into a thermos to pack as an offbeat lunch for school or office; pack the tortilla chips separately. Combine the beans and salsa in a small saucepan. If the beans are too thick and clumpy, add a little water to loosen, but let the mixture remain thick. Heat until hot and bubbly. Transfer half the bean mixture to a serving bowl. Sprinkle with half of the optional scallions and half of the cheese. Pour in the rest of bean mixture and pat in evenly. Sprinkle with the remaining optional scallions and the remaining cheese. Cover and keep warm until serving. Place in the center of a platter and surround with tortilla chips.